If you are using a Raspberry Pi 3 B+, then you will not need to use the included heatsink for the top of the Pi. The board has a low profile aluminum heatsink. The tall heatsink is for the previous versions of the Raspberry Pi. C4Labs’ products are available to ship domestically and internationally*. We are located in Tacoma, WA, USA and ship through the United States Postal Service (USPS). We ship First Class and Priority for Domestic and First Class for International. USPS estimates 2-8 business days for domestic delivery. International shipping times vary and depend on factors outside of our control. All of our packages are shipped within 2 business days unless the customer has been notified. *VAT, duty, or custom fees are not covered for domestic or international shipping. Contact your local shipping or government agency for more information. Does the case come with heatsinks? Most all of our Raspberry Pi Cases come equipped with 2 -3 heatsinks. The exceptions would be cases for boards that don’t use heatsinks, or boards that come with their own set such as the Tinkerboard, Arduino, and CHIP. Can you put a logo on the case? Yes. We do offer the service of putting logos on our cases. We also give wholesale price breaks for ordering bulk quantities. If you are interested please visit our Design Services page. Do you offer wholesale pricing on your cases? Yes! If your company is looking to purchase our cases at wholesale, visit our Design Services page. The more you buy the better the price. Why does shipping cost so much outside of the United States? Our shipping costs are the prices that are charged by the United States Postal Service (USPS). VAT, duty, or custom fees are not covered by C4Labs for domestic or international shipping. Contact your local shipping or government agency for more information. In some cases, international postal agencies may hold items until fees are paid. Will the addition of a hat fit in the case with my Raspberry Pi? Do you have a case that fits_______? If you don’t see a case for a particular board on our site, we probably haven’t made it yet. We are always willing to take suggestions. (It is most likely on our radar and maybe you are the nudge we need.) So visit our Product Ideas page and fill out the form. Why did you send me a cardboard case? Though it may look like cardboard, it is really just a protective paper that is on the acrylic. It can be peeled off using a fingernail or credit card edge. Another option is soaking that piece in warm water. The paper should slide right off, leaving no residue. Where can I find instructions for my case? There is a problem with my case what should I do? Please email help@c4labs.com We care about our customers satisfaction and want you to have exactly what you need. The wood looks different than the picture, why? The beauty of wood is that it has a natural range of colors and grain variation that we take advantage of to make each product unique. Why can’t I order more than 9 of a single product? If you are interested in ordering more than 9 of a single item, then we offer bulk discounts and a different shipping structure. Just visit our Design Services, fill out the form, and we will contact you with quotes! Can I get more airflow in my case? Many of our cases have a faceplate that can be left off if you want more airflow through your case. 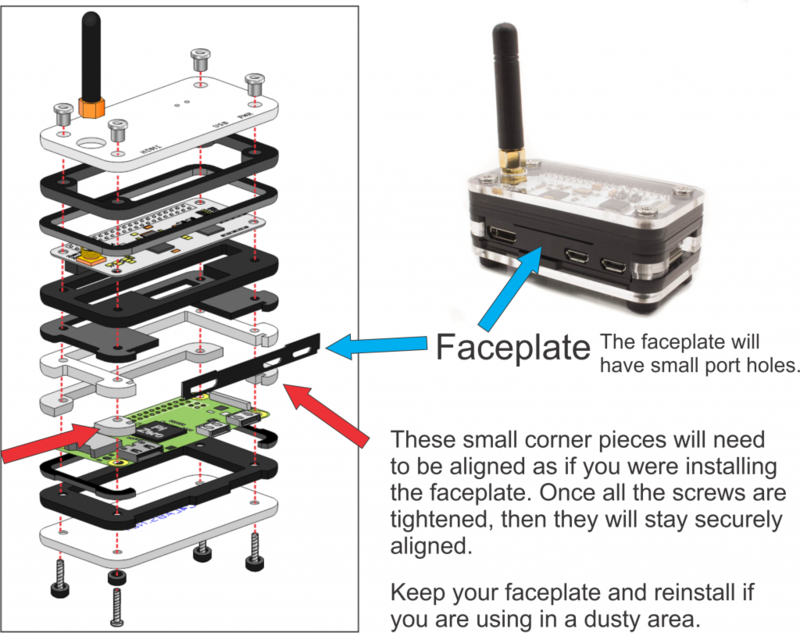 Removing the faceplate will not affect the construction of your case.